Perhaps you've read that Forza Motorsports 3 is coming out for Xbox. The game will be filled with all kinds of vehicles, both high-powered and, well, not so much. If you're anything like me, you kinda like using the little underpowered (and not so underpowered) runts in these games (ah, the turbocharged Mitsubishi Pajero Mini on GT3). 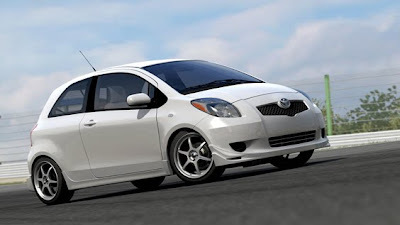 And yes, Forza 3 will have the subcompacts. You can find the list of Forza 3 cars here. However, you can find all of the subcompact cars below. Oops. They included the Yaris S, the Versa, Aveo5, Scion xD and Fit Sport, but left out the Accent SE....which can likely out-handle them all. It has more hp than the Aveo and Yaris as well. Hyundai is still not getting the respect and consideration it has earned I guess. I wouldn't doubt, stock for stock, an Accent could out-handle the vehicles you mentioned, since the Accent SE has 17" wheels. However, add stiffer shocks, rear swaybar, blah, blah blah, and they'll likely all handle very similarly. They all have front struts/rear torsion beam. Then it becomes a question of weight and driver. An Aveo5 and a Versa. Two of the LAST vehicles I would ever choose if I wanted to hit the track!